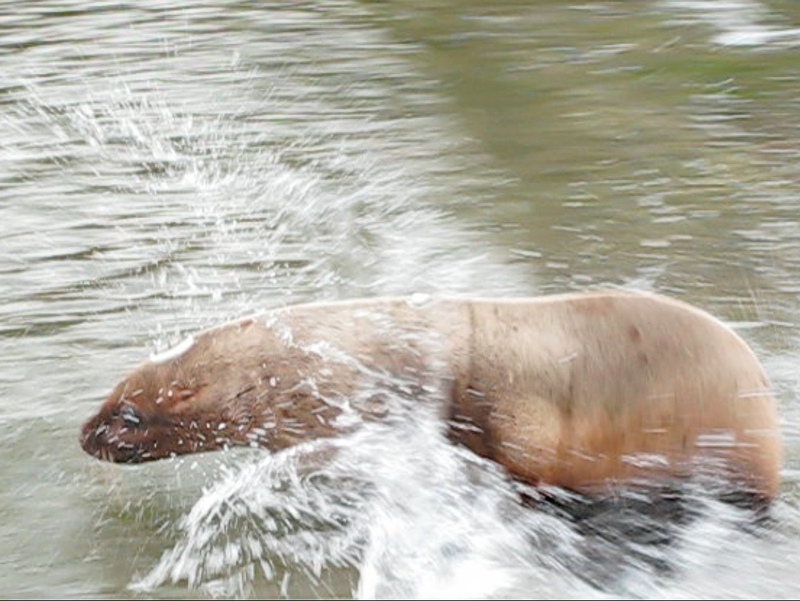 Kaouk – The Next Chapter of “The Steller Sea Lion That Flew”! [Updates up to April 6th provided below. For more recent updates – including a photo of Kaouk hauled out with other wild Steller sea lions, click here. Kaouk was released back into the wild on March 17th, from Toquart Bay on southwestern Vancouver Island (where the herring are bountiful) and . . . now you can follow his progress! Kaouk, is the male Steller sea lion that walked into the Port Alice trailer park on December 16th and was flown to the Vancouver Aquarium’s Marine Mammal Rescue Centre. He inspired the students of Port Alice to write a children’s book and will no doubt continue to be a charismatic marine ambassador to we humans; helping us understand his species, when to help wild animals, ad when to leave them be. For the Vancouver Aquarium’s announcement of his release click here. The announcement includes the link to where you can follow him via a satellite tag that was attached to Kaouk’s fur with epoxy and will fall off when he moults. 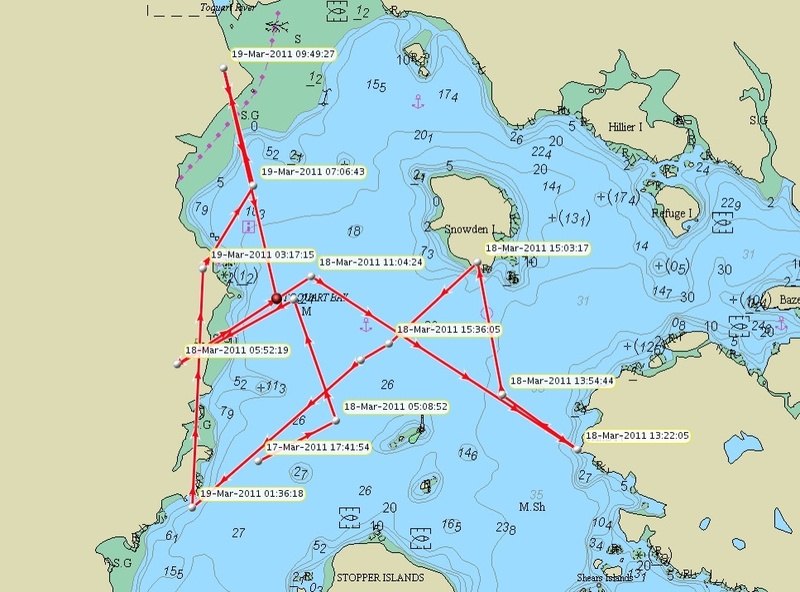 Click here for the direct link to the tracking data. Click here for a previous blog posting giving background on Kaouk. And click here for a 1-minute video of his enthusiastic return to the wild, made available by Peter Olesiuk (DFO). Kaouks wanderings to the morning of April 6, 2011. He has been exploring and hauling out a lot. See text for update. 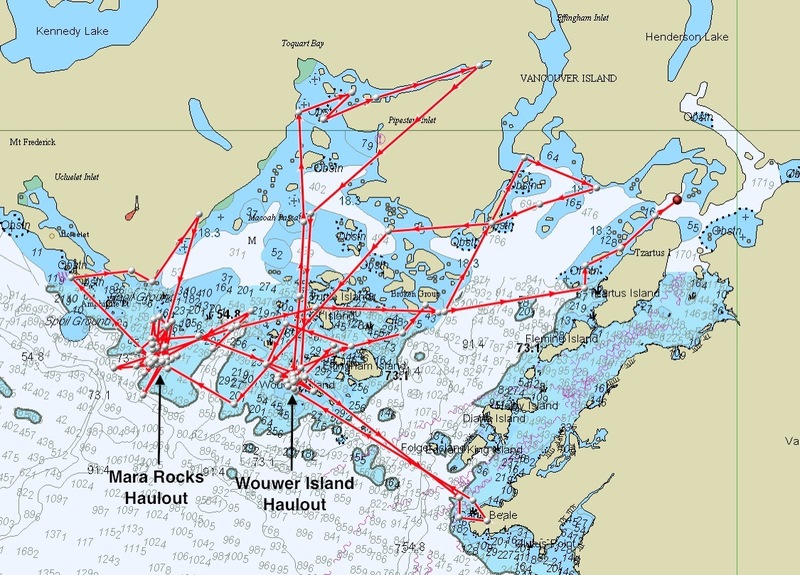 See the image below – Kaouk has been exploring Barkley Sound and hauling out on a regular basis over the last 10 days, first at Mara Rocks (the largest and only year-round Steller haulout in Barkley Sound – see previous update) and more recently at Wouwer Island (a winter haulout occupied by Steller and California sea lions mainly outside of the May-August breeding season). He has been frequenting areas knowing to be good herring spawn areas, and areas known to have concentrations of sardines). Go Kaouk go – eat lots! Scientist Peter Olesiuk of DFO reports that he needs to eat 15-20 kg per day, which is apparently a challenge. Scientist Peter Olesiuk of DFO reports that about 46% of sea lions don’t make it through their first year. Click to enlarge. 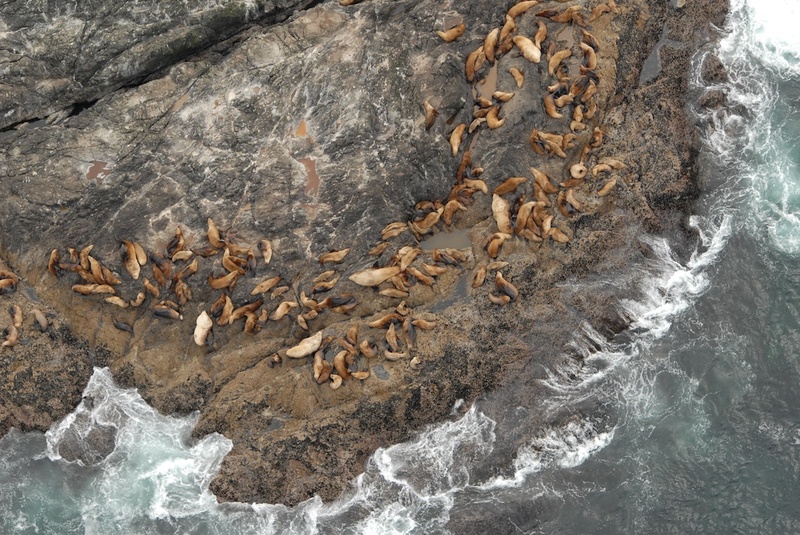 Mara Rock - the Steller sea lion haul out that Kaouk has been frequenting! Image provided by Peter Olesiuk (DFO). Kaouk is with his own kind! Since the evening of March 25th, he has been hauling out and foraging around this haulout on Mara Rock. Peter Olesiuk of DFO kindly shared that Mara Rock is the largest Steller sea lion haulout in Barkley Sound and that it is the only site that is occupied year-round (600+ animals, including lots of juveniles like Kaouk, at this time of year). Images below provided by Peter Olesiuk show the Mara Rock haulout and, in the satellite tracking image, Mara Rock is in the bottom left corner (note how consistently he has been at this site). Most of his dives are reported to be between 20 to 50 m with a few in the 50 to 100 m range. Click to enlarge. Satellite image from AM of March 30th. Note the concentrated activity in the bottom left of the image. This is Mara Rock - a large Steller sea lion haulout!!! Update March 19th: If you have been looking at the satellite data for Kaouk, please note that the locations are only updated once a day (data is not real-time) and that locations are not very “refined”. 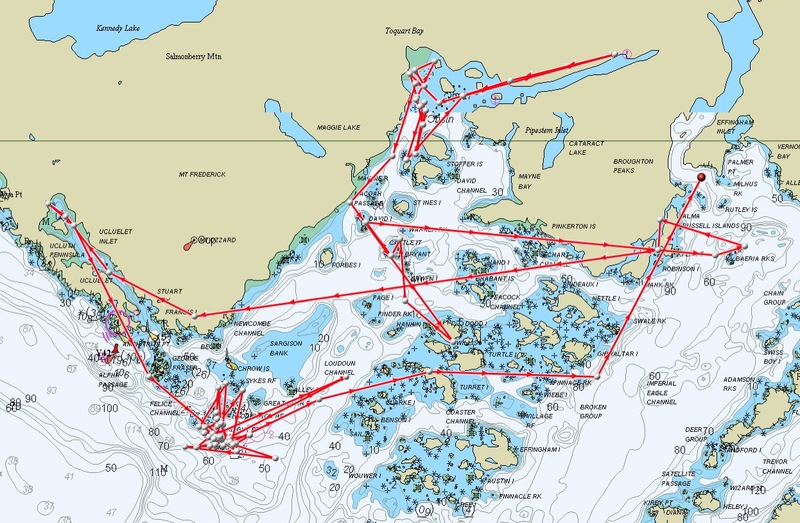 The map below (provided via Marine Mammal Rescue) gives a far more accurate look at Kaouk’s adventures. It looks like he hasn’t even come ashore in his first days in the wild! He has been actively diving and hopefully filling himself up with herring. Kaouk - March 17th to +/- 09:00 March 19th. Image via Vancouver Aquarium Marine Mammal Rescue. Hi Jackie! Bravo! I was so excited to read about the successful release of Kaouk! That’s wonderful! And I think that’s very interesting to be able to see his travels with the help of the satellite tag. I plan to share his story to the students I talk to about the California/Connecticut Steller Sea lion, Astro. And, I love the picture from the students’ book about Kaouk — terrific! Want to get one of the little books to you, could you email me your mailing address? There is no doubt that you were a significant part of the formula of inspiration with your great kindness of sending your book to me so that it could be shared with the Port Alice students.